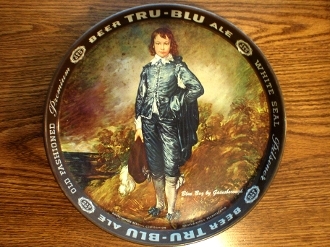 Tru-Blu Beer & Ale, Northampton Brewing Co., Northampton, Pennsylvania, says “White Seal Pilsener” and “Old Fashioned Premium” on inside and outside of rim, measures 12” in diameter by 1” deep, feature famous painting Blue Boy by Gainsborough, manufactured by Continental Can Co. Circa 1940's. Typical aging surface rust splotching throughout. Displays nicely.